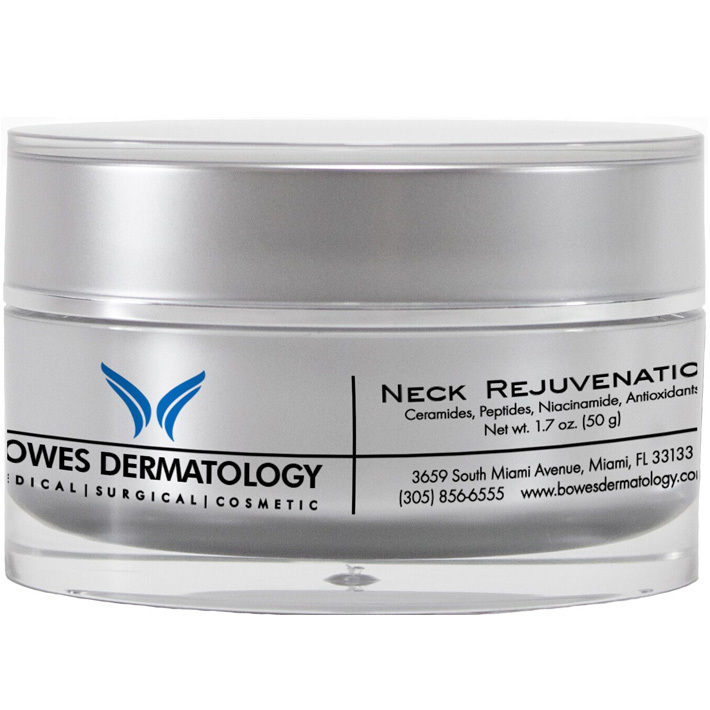 Bowes Dermatology’s Neck Rejuvenation Cream contains Antioxidants, Ceramides, Peptides, Niacinamide and the lastest in Stem Cell Technology to rejuvenate the neck. 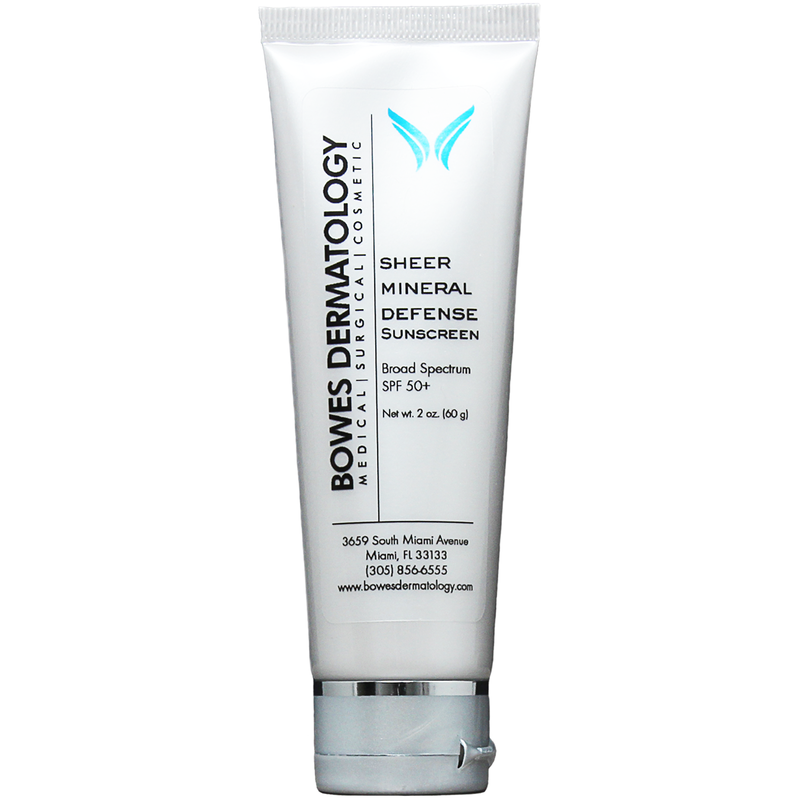 This formulation helps prevent water loss, repair the skin barrier and promotes healthy Collagen production for a smoother and tighter skin. Massage gently onto neck and jawline twice daily or as directed by your doctor. Purified Water, Caprylic/Capric Triglyceride, Glyceryl Stearate, Glycerin, C12-15 Alkyl Benzoate, Dimethicone, Squalane, Niacinamide, Caffeine, Leontopodium Alpinum Callus Culture Extract, Tocopheryl Acetate, Bambusa Vulgaris Extract, Pisum Sativum (Pea) Extract, Glucosamine HCL, Ceramide AP, Ceramide EOP, Ceramide NP, Ceramide NG, Phospholipids, Phytosphingosine, Cholesterol, Sodium Lauroyl, Lactylate, Camellia Sinensis (green tea) Polyphenols, Malus Domestica Fruit Cell Culture Extract, Ubiquinone (Coenzyme Q10), Anthemis Nobilis (Chamomile) Flower Extract, Mentha Piperita (Peppermint) Leaf Extract, Eucalyptus Globulus Leaf Extract, Lavandula Angustifolia (Lavender) Flower/Leaf/Steam Extract, Pyrus Malus (apple) fruit extract, Camellia Sinensis (Black Tea) Leaf Extract, Vaccinium Macrocarpon (cranberry) Fruit Extract, Rose Extract, Pogostemon Cablin (Patchouli) Leaf Extract, Rosmarinus Officinalis (Rosemary) Leaf Extract, Mentha viridis (Speamint) Extract, Lecithin, Palmitoyl Hexapeptide-12, Saccharomyces Lysate Extract, Palmitoyl Pentapeptide-4, Tribehenin, Cetyl Palmitate, PEG-100 Stearate, PEG-10 Rapeseed Sterol, Cetearyl alcohol, Hydrohyethyl Acrylate/Sodium Acryloyldimethyl Taurate Copolymer, Butylene Glycol, Polysorbate 20, Polysorbate 60, Carbomer, Xanthan Gum, Phenoxyethanol, Caprylyl Glycol, Sorbic Acid, Potassium Hydroxide, Disodium EDTA.